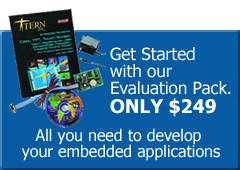 The Ethernet-TFT(ET) is designed as a low-cost, C/C++ programmable controller supporting Ethernet and a color 3.5¡± TFT display. The ET boots up within 1 second. It is intended for networking industrial process control, high-speed data acquisition, and panel-mounting or hand-held user interface for many OEM products. The ET is a high performance, low cost, C/C++ programmable controller supporting a color 3.5 inch color TFT display and touch screen or keys. It is intended for networking industrial process control, high-speed data acquisition, and panel-mounting or hand-held user interface for many OEM products. The ET has on-board Ethernet, CompactFlash, RS232, RS485, 24-bit ADC, high speed 16-bit ADC, 16-bit DAC, relay and solenoid drivers. Whthin less than 1 second after power-on or reset, the user code can start full application functions. The 3.5 inch color TFT display has 320×240 pixels and a 71×54 mm viewing area. Each pixel uses 16-bit (5R, 6G, 5B) TFT color. It embedded with a high performance graphic controller with 2D drawing engine to support high speed line, box, and circle drawing. Six mechanical push buttons or a Touch Screen can be installed. Easy user interface software is available. A Fast Ethernet Module can be installed to provide 100M Base-T network connectivity. This Ethernet module has a hardware LSI TCP/IP stack. It implements TCP/IP, UDP, ICMP and ARP in hardware. The hardware Ethernet releases internet connectivity and protocol processing from the host processor. Software demo is available for connecting to Windows Internet Explorer. A sigma-delta 24-bit ADC (LTC2448) offers 8 ch. differential or 16 ch. single-ended input channels. A peak single-channel output rate of 5 KHz can be achieved. A 16-bit parallel ADC (AD7655, 0-5V) supports ultra high-speed (1 MHz conversion rate) analog signal acquisition. The AD7655 can simultaneous sample on two channels of a total of 4 analog inputs. A 16-bit DAC (LTC2600) provides 8 analog output voltages (0-5V). Two channels of 12-bit DAC (DAC7612) can output 0-4.095V analog voltage. 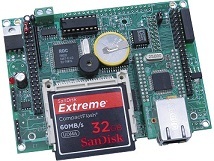 The ET supports CompactFlash cards with Windows compatible FAT file system support, allowing user easily transfer large amounts of data to or from a PC. The ET includes ACTF Flash (256 KW) and SRAM (256 KW). It also includes 3 timers, PWMs, PIOs, 512-byte serial EEPROM, two RS232 ports (One can be converted to RS485), 3 timer/counters, and a watchdog timer. A real time clock (RTC72423) is available. Seven high voltage sink drivers are installed, capable of sinking 350 mA at 50V per line, and they can directly drive solenoids, relays, or lights. A mechanical Reed relay provides reliable, fast switching contacts with a specification of 200 V, maximum 1 Amp carry current, 0.5 Amp switching, and 100 million times operation. The ET runs on approximately 280mA at regulated 5V with TFT on. Optional switching regulator or low-drop regulator can provide power-off mode allowing micro-Amp DC power consumption. With default linear regulator, 9-12V, or Switching regulator, 9-24V DC, or low drop regulator, 5.1V-9V DC power can be used. 4.2 x 3.1 inch, 280 mA at 5V DC power with TFT on. Boot time in less than 1 second.